These gloves are great for food preparation. They are FDA approved for use with food applications. Excellent for protecting hands and the materials being worked with. They are latex-free, making them a great option for people who have allergies, or who are working with patients who have allergies. Each glove can fit on the left or right hand- there is no need to find a pair, as each glove is able to be worn both ways. These gloves are designed to fit close to the skin. This helps protect both the hands of the user, and the materials being worked with. They have a seam at wrist to provide a more snug fit, and to help prevent the gloves from rolling down. POWDER AND LATEX FREE: These gloves are made of nitrile, and without rubber latex. They are ideal for any user, including people with latex allergies or sensitivities. Take no risks with employee and client safety, and provide 100% latex free gloves. Powder free gloves mean there is no powdery residue left behind from the gloves- perfect for keeping clothes clean and neat. DURABLE, AMBIDEXTROUS DESIGN: These durable gloves offer puncture resistance for the wearer. Perfect for working in environments with tools and sharp objects. Each glove can be worn on the left or right hand- making it easy to grab a pair without sorting through the box. PROTECT HANDS: These gloves are resistant to oils and some chemicals. They are designed to be a barrier between materials and hands, not the sole source of protection when handling dangerous goods. FDA APPROVED: These gloves are FDA accepted for food applications, making them perfect for restaurants, grocery stores , and other food prep areas. They are not approved for medical use. 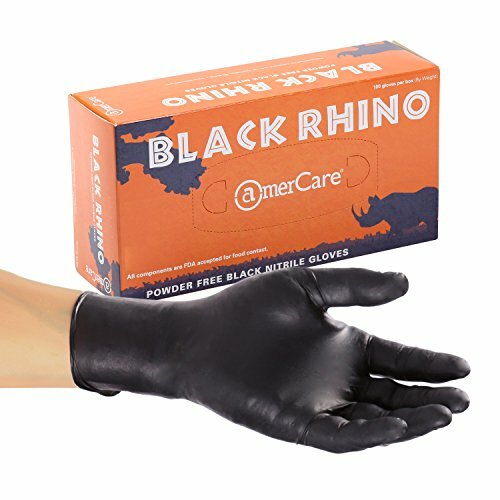 TEXTURED GRIP: Made from nitrile, Rhino gloves are textured. Grip knives and other tools with ease and confidence while wearing these gloves. If you have any questions about this product by Amercare, contact us by completing and submitting the form below. If you are looking for a specif part number, please include it with your message.